Humans have been flint knapping for thousands of years. Until the arrival of iron smelting it was the only way that sharp objects like arrowheads and knives could be made. It is now a dying art, but one that could make a big resurgence in the face of an apocalyptic event that knocks out electrical equipment. The iron smelting process is far too complex and time intensive to be feasible on a small scale basis, so learning how to knap flint is your best way to make your own tools for hunting. Arrow heads – this has traditionally been the most common use for flint over the course of human history. The bulbs of flint that you’ll be able to find naturally lend themselves to regular arrow heads and the shape is easy to produce in a short period of time. Knives – a knife will be one of the most important parts of your survival kit and being able to construct them out of flint means that you don’t have to worry about breaking the metal blades. You’ll need to practice making a variety of shapes and sizes for different usages as well as experimenting with serrated blades for cutting ropes and twine. Axe – the shape of an axe head is quite hard to achieve with flint so it will be one of the last projects that you’ll need to perfect. The difficult part is to make a long enough slot for the handle so that the head remains strong when you swing it with full force into a tree. At this moment in time, you can get hold of supplies of flint, obsidian and other rocks that are suitable for knapping from the internet. However, in a survival situation, you’ll need to be able to locate a source of flint near to your home and be able to identify which bulbs will work best. You need to avoid lumps that have any large cracks, bubbles or crevasses that will affect the structural integrity of the stone. You also need to have a piece that is small enough to produce the tool that you desire and large enough that you can make a mistake without shattering the whole project. 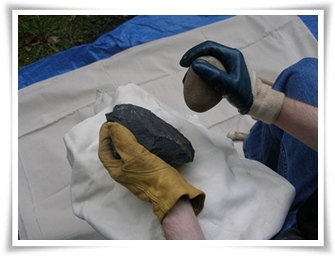 Traditionally, flint knapping takes place in a sitting position with the flint being held in one hand and the smashing stone in the other. The first trick is to find out if there is any directional graining in the flint and knap in that direction. You then need to strike at the edge of the core piece to break off a thin flake of flint. When you’re first learning how to knap, don’t be afraid to let these be thicker than you had planned. Finally, you’ll need to have a pressure tool like a spoon or an antler to press smaller pieces from the center of the flake outwards. This will give you sharp serrated edges that can be smoothed with a whetting stone. As with all forms of tool making flint knapping carries some inherent dangers. The most common is shattering that comes from striking the core piece too hard and can result in injury through cuts. The best protection is to wear a thick apron over your lap to protect yourself. The other is rock dust which can be hazardous to your health if you breathe it in. Avoid this by knapping in a well ventilated area.